The most distant gravitational lens yet has been found at a colossal distance of 9.4 billion light-years. The chance discovery by an international team of astronomers not only allowed the team to directly measure the mass of the distant galaxy that caused the lensing but has also led to questions about the more distant object whose light was lensed. The magnified object is a type of dwarf galaxy that is thought to be rare and the chances that such a peculiar galaxy would be gravitationally lensed are small. Therefore its observation suggests that current theories have underestimated the number of such galaxies in the early universe. A gravitational lens is a large galaxy or group of galaxies that bends or "lenses" light from a distant source as it travels towards an observer. The effect was predicted by Einstein's general theory of relativity. In rare cases the lens, the distant light source and the observer line up precisely and the result is an "Einstein ring" – a perfect circle of light around the lensing mass. However, if there is any misalignment along the way, astronomers observe partial arcs, spots and other such distorted images, depending on the relative positions of the bodies. Such a lensing effect has proved to be useful – researchers can determine the mass of the lensing galaxy including its dark matter content – thanks to the amount of distortion or lensing observed. The lensing effect also acts as a "natural telescope" of sorts, magnifying details of distant galaxies that would be difficult to observe otherwise. Indeed, ever since the first evidence of such lensing was seen in 1979, astronomers and cosmologists have used the phenomenon to find distant objects and supernovae and to even map the dark-matter content of our universe. Now, a team led by Arjen van der Wel from the Max Planck Institute for Astronomy in Heidelberg, Germany, along with colleagues in Italy and the US, has, rather accidently, detected the furthest such lens. Van der Wel was reviewing observations made with the Large Binocular Telescope in Arizona that were part of another study that looked at the spectra of massive, old galaxies. "[I] noticed a galaxy that was decidedly odd. It looked like an extremely young galaxy, and at an even larger distance than I was aiming for," says Van der Wel. Intrigued by the anomalous object, he looked at other images of the object taken with the Hubble Space Telescope as part of the CANDELS and COSMOS surveys and once more the object looked like an old galaxy but with some irregular features. As a result, Van der Wel suspected that he might be looking at a gravitational lens. 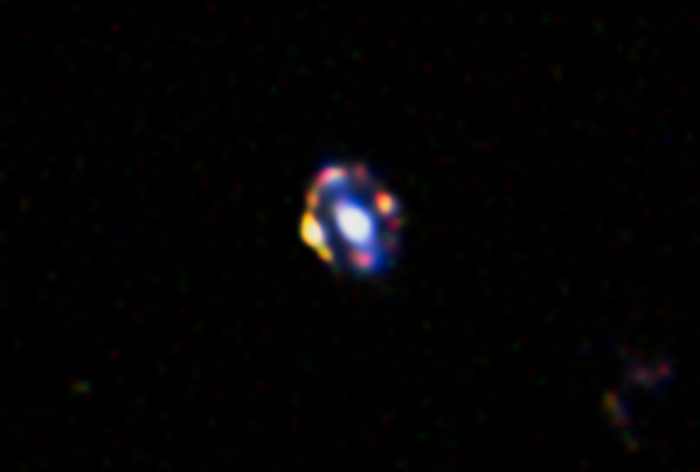 He combined all the available images of the object and corrected for the haze of the lensing galaxy's stars to see a "quadruple lens" that formed an almost perfect Einstein ring. The researchers found that after being deflected, light from the lens travelled nearly 9.4 billion years to reach us, corresponding to a redshift of z = 1.53. This puts the lens much further away than other lenses discovered to date. From the amount of distortion observed, the researchers calculated that the lens galaxy has a total mass of 8 × 1010 solar mass. From that, nearly 75% of this is made up of stars, meaning that the rest of the mass could consist of dark matter. But Van der Wel explains that uncertainties are such that all mass in the lens can be accounted for by stars only. Seeing an Einstein ring also means that both the lens and the background light source are aligned to better than 0.01 arcseconds – that is equivalent to a 1 mm separation at a distance of 20 km. Van der Wel tells physicsworld.com that this was indeed a rare alignment – "If the light rays are darts thrown in New York City, then they managed to hit the bullseye of a dartboard in Boston. Now, the universe throws many darts around (there are many background galaxies) and has many dartboards (many potential foreground lenses), but not that many. The chances of hitting a dartboard are not so small, but the chances of hitting the bullseye..." exclaims Van der Wel. But the distance and fortuitous alignment were not the only surprises from this study. The background light-source galaxy (even more distant at z = 3.41) itself proved to be a "star-bursting dwarf galaxy". This is a comparatively low-mass galaxy (only about 100 million solar mass worth of stars) that is extremely young (only about 10–40 million years old) and produces new stars at an enormous rate. Such dwarf starburst galaxies are thought to be rare and the chance of these peculiar galaxies being lensed is small. Yet this is the second starbursting dwarf galaxy found to be lensed. This might force astronomers to re-think their models of galaxy evolution as starbursting dwarf galaxies might be much more common than previously thought. "Perhaps only one in a hundred faint galaxies is a starbursting dwarf galaxy. That combined with the chance alignment makes this a very unlikely object," says Van der Wel. The research is to be published in Astrophysical Journal Letters. A preprint is available on arXiv.